It has become cliché to use the term “mixed bag” to describe anything with both good and bad qualities, but there is no better term for the kind of year Apple has had in 2017. It was a year marked by some of Apple’s best product releases in years, and the company has the growing sales to match. At no point in Apple’s history has it has so many products that reach so many people, and it has never had a bigger impact on the world of consumer technology. These bright notes are soured by a whole host of screwups, delays, and stagnation. Perhaps Apple’s doing too much too fast, but it seems that the most valuable company in the world should probably have the resources to maintain quality as it expands its reach. Here’s a look back at Apple’s major hits and misses of 2017. 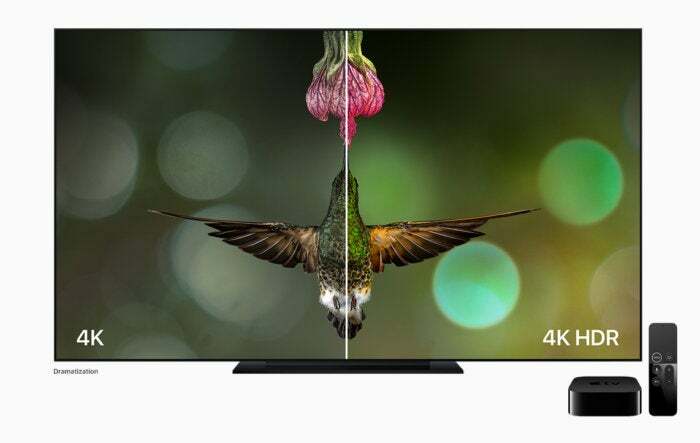 Apple has always made sophisticated hardware with incredible craftsmanship, but Android enthusiasts could rightly lay claim to a few very desirable features. This year, Apple finally delivered wireless charging, an extremely “bezel-less” design, fast charging via USB Power Delivery, and perhaps the world’s best OLED display in a mobile device. iPhone 8 and X bring us features we’ve long desired, like wireless charging. We could argue about other features like removable storage, but for the most part, the iPhone line is no longer feels like it’s missing significant features relative to top-tier Android phones. Apple caught up in other areas, too. The Apple TV 4K feels like the last streaming box to support 4K and HDR, but it’s one of the best. And Apple did the right thing by making iTunes movie purchases and rentals in 4K cost the same as the HD version, and even updated HD movies in your library to the 4K version automatically (if available). Apple is late to the 4K streaming party, but it delivered a great box. When it comes to smart watches, there’s Apple Watch and there’s everything else. Apple’s dominant position in this market hasn’t stopped fans from looking sidelong at those Galaxy Gear watches with LTE, wishing Apple would get the hint. Apple delivered in a big way with Apple Watch Series 3, which manages to pack LTE support and a faster processor into the same form factor. When you look at the whole picture— speed, software support, interface, build quality, aesthetics, size, comfort, battery life–Apple Watch Series 3 is so far ahead of the rest of the smartwatch market it’s laughable. 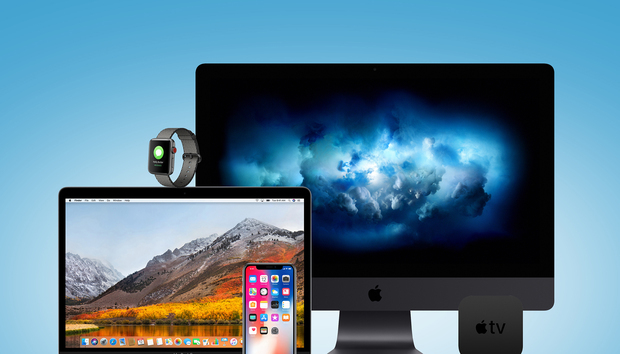 While much of Apple’s hardware efforts in 2017 could be viewed as catching up to features present in top competitors, we also saw industry-leading innovations. Take Augmented Reality. ARKit in iOS 11 is leagues ahead of the competition. The maturity, accuracy, and robustness of these developer tools resulted in a mini-explosion of AR apps. And while Google’s Project Tango has never caught on, ARKit apps run on any iPhone or iPad sold in the last few years—hundreds of millions of devices. Google tried to catch up with ARCore, but it has limited reach and scale. It seems made in clear response to Apple’s ARKit. Face ID is way ahead of anything on any other phone, and is going to be copied everywhere. 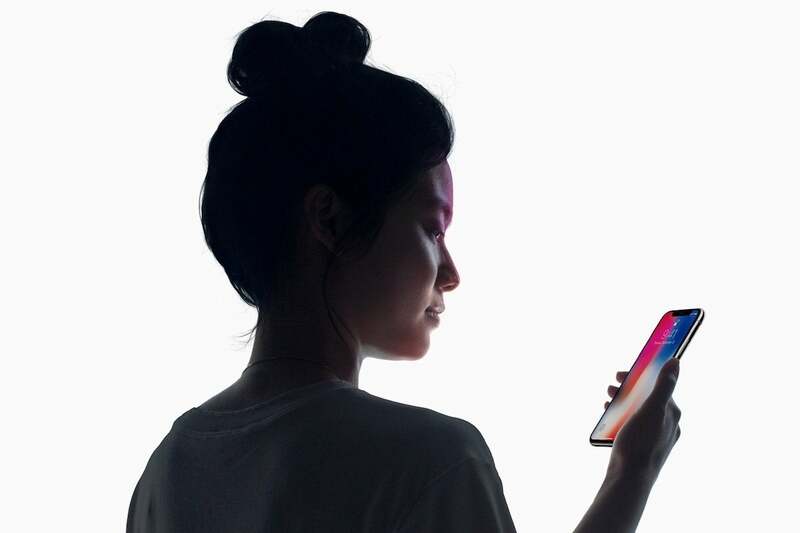 Face ID on iPhone X is another great example of Apple pushing the industry forward. The TrueDepth camera is far more sophisticated than the front-facing sensors on other phones. 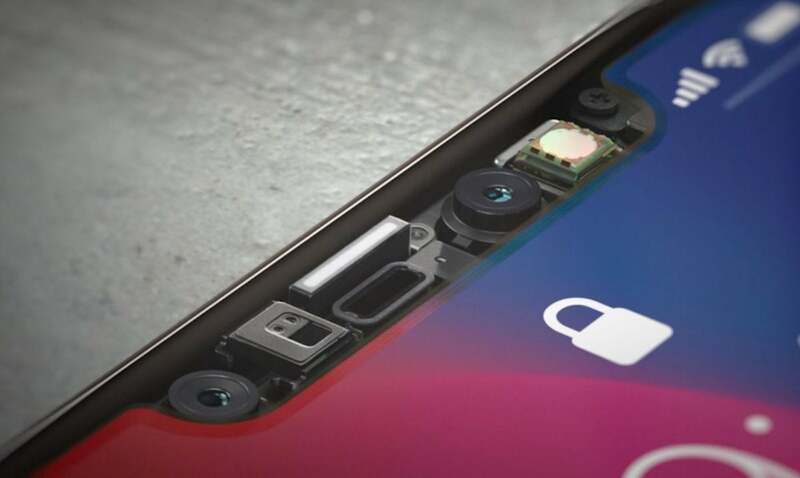 Apple’s not the first to implement facial recognition in a phone, but it’s the first to do it with the speed, reliability, and security necessary for it to fully replace your fingerprint, even for authenticating purchases. There was controversy around Face ID and the elimination of Touch ID, but time has proven it to be a hit. You’re going to see Face ID and other TrueDepth features like Animoji copied by everyone else in the course of the next year or two. And, while the iPad didn’t a major overhaul (we could see that in 2018), Apple continues to dominate the premium tablet market with features, performance, battery life, and app support far beyond its Android competitors. The 10.5-inch iPad Pro is easily the best iPad Apple’s ever made. For all of Apple’s leading advances, there are some core products that feel like they’re coasting. Siri is perhaps the most important area in which Apple is being left in the dust but its competitors. iOS 11 brought only marginal improvements, while Amazon’s Alexa and Google Assistant are in a whole other league. Siri simply understands our speech less effectively, delivers less desirable results, is all-around less reliable, and has a very limited feature set compared to Alexa and Assistant. For Siri to catch up, it has to make major strides along every axis, all while Google and Amazon drive forward as fast as they can. This is not an area where Apple should be content with second-best, much less distant third. Apple’s Photos app suffers similar deficiencies compared to the best from Google. From a service standpoint, Google offers free unlimited photo and video storage with the purchase of one of its phones; a huge benefit that would be trivial for Apple to replicate. Google Photos’ ability to quickly and accurately identify people in our photo libraries is light years beyond Apple’s (it even does pets! ), and its AI-powered search functions are an order of magnitude more advanced. Apple has rarely jumped aboard the latest processor releases as fast as the Windows ecosystem, but there’s little excuse for the MacBook Pro to still sport a dual-core CPU when those quad-core 8th Generation Core i7 processors are all over the Windows laptop scene. It’s not a big platform overhaul—these are almost drop-in replacements. We’ve got a laundry list of substantial changes we’d like to see in the MacBook line, but in the meantime, Apple could at least keep the processors current, especially when the new model offers such enormous performance benefits. iOS 11 is a really, really big update. 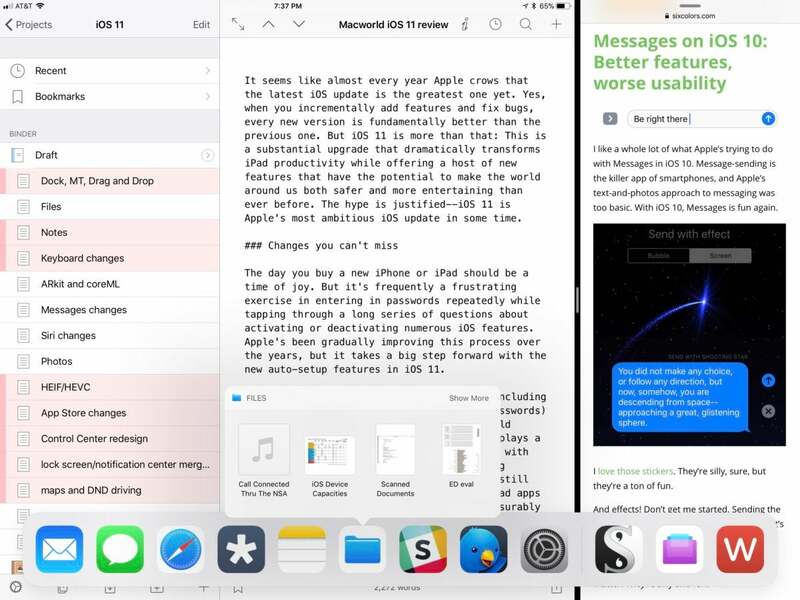 It’s the most ambitious iOS update in years, and incorporates a lot of new under-the-hood technologies together with significant new design changes. There’s so much “new” in there. New setup experience. New control center. New app store. There are new toys for developers like ARKit, new photo and video formats (HEIF/HEVC), improvements to Siri, indoor Maps...the list is extensive. iOS 11 makes the iPad dramatically more functional. Nowhere is iOS 11 a bigger deal than on iPad. 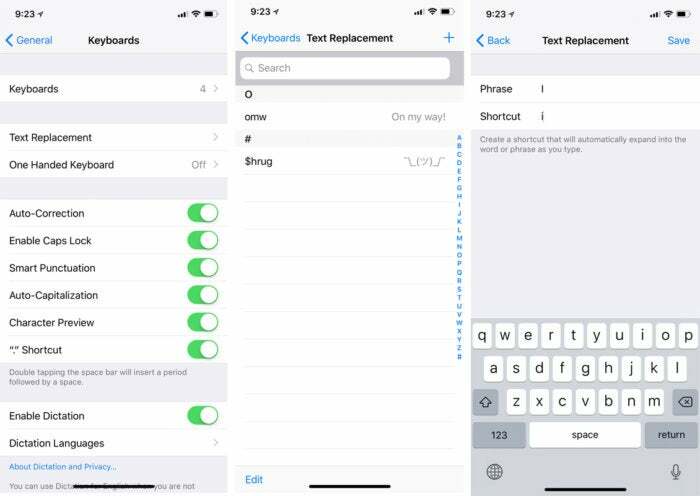 iPads with iOS 11 are capable of serious work thanks to a new Dock, changes to multitasking, drag-and-drop support, and a smart new keyboard feature called QuickType. iOS 11 is full of bugs, and Apple just can’t seem to shake them. Every iOS release coincides with complaints about it “slowing down my iPhone,” many of them imagined. iOS releases also prompt cries of, “it ruined my battery life,” but in iOS 11 there seems to have been some real bugs that caused serious battery life problems for a big number of users. Apple’s problems with iOS 11 seem never-ending. A quick 11.0.1 update fixed a problem with Exchange email servers. 11.0.2 fixed a problem that caused some iPhone 8 and 8 Plus owners to hear crackling in their earpieces. Then there was a problem with haptic feedback on some iPhones, fixed in 11.0.3. The 11.1 release added lots of new emoji, but introduced a really obvious bug: typing a capital “I” autocorrected to a capital “A” followed by an undecipherable unicode symbol. Oh, but then some iPhone X users found that their touchscreens stopped working in cold weather, and that had to be fixed in 11.1.2 (along with a bug with Live Photos). Apple even had to kick out iOS 11.2 in the middle of the night on a weekend, because it fixed a bug whereby daily notifications would cause iPhones to reboot starting at 12:15am on December 2. Apple didn’t end the year on a high note, confirming what many iPhone users had speculated: The power management built into iOS can slow down performance on iPhones with old batteries. This isn’t a bug, however, and Apple’s reasoning makes sense; the company is trying to preserve battery life on older iPhones. But Apple screwed up the messaging to its users, and it’s led to a number of class-action lawsuits that will probably be settle sometime next year. Amateur-hour bugs like these are the antithesis of the Apple marketing pitch—that when you control the hardware and the software, “it just works.” Lest iOS have all the fun with dumb bugs that should have been caught, macOS got in on the fun with a the very serious Root Bug. The company responded very quickly, but then botched that by breaking file sharing and re-introducing the bug if you upgraded to 10.13.1 after installing the fix. Wasn’t the whole point of macOS High Sierra to focus on reliability and performance instead of introducing major new features? Apple’s had a rough year with software. iOS 11 has a ton of big improvements, but some of its features didn’t make release and the reliability has been far below the company’s usual standards. Even some of the releases that weren’t bug-ridden caused headaches, like when iTunes 12.7 dropped support for iOS apps. It’s a necessary step in de-cluttering the bloated mess that is iTunes, but it could have been handled in a way that didn’t catch so many users off guard. As much as Apple has done this year, it was supposed to do more. Delays are a normal part of tech, but this is rarely true of Apple; the company develops in secret, only announcing something when it is sure it is going to release when promised. But we’re still waiting on Messages in iCloud. We had to wait months for Apple Pay Cash. 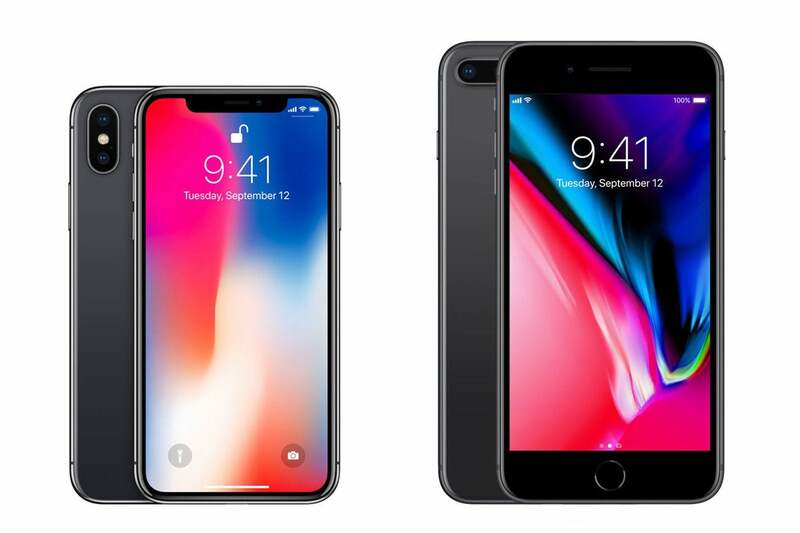 Thanks to manufacturing difficulties, the iPhone X had to launch six weeks after the iPhone 8 and 8 Plus, and was set to be in very limited supply for many weeks thereafter. Apple and its partners have done a great job fixing supply issues and improving availability, but it’s a delay that shouldn’t have happened. Apple’s complex TrueDepth camera array caused a delayed launch for iPhone X, and shipping shortages. It was rectified quickly, at least. HomePod is already a year or two behind its competitors in the home speaker space, and now it’s going to miss 2017 entirely. Missing this holiday season will certainly impact sales—Alexa and Google Home are hot items, and people don’t want to buy another smart speaker just a few months later. Especially one that, at $349, costs way more. In some cases, Apple promised a release by the end of the year and just barely squeaked in under the wire. Amazon Prime Video on Apple TV dropped in December (six months after its announcement) and the iMac Pro is shipping with just a couple weeks left in 2017—and you can’t even buy the big 14- and 18-core configurations. We put a lot of pressure on Apple. We constantly expect new market-defining, groundbreaking products on the scale of the iPhone or iPad. If a year passes without an Apple Car, or Apple AR Glasses, or an Apple over-the-top streaming television service, we read scores of op-ed missives about how Apple has lost its ability to innovate. I think more important than Apple’s ability to disrupt new industries is its implicit promise to its users: that complete vertical integration and fanatical attention to detail makes Apple products more reliable, performant, and secure than their counterparts. 2017 was a year marked by a bunch of exciting new Apple releases in both hardware and software, but a heaping pile of shameful bugs and product delays cast doubt about Apple’s ability to execute at the quality level we expect. If there’s one thing we want most from Apple in 2018, it’s a commitment to improving quality. And a new Mac Pro.